Why look, it's that acrobatic, red-suited superhero with a secret disability! No, the other one. You know, Daredevil. No, the other one. 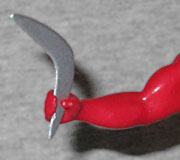 Wielding two powerful boomerangs thrown with expert skill, the duo-toned Daredevil was created by Jack Binder as a yellow and blue mute superhero in 1940's Silver Streak #6. 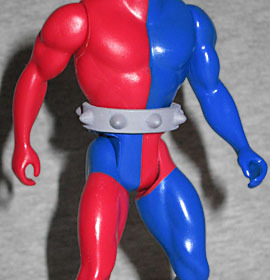 Promptly retooled by future Plastic Man creator Jack Cole into the red and blue dynamo with the spiked belt, he fought both Hitler and the monstrous Claw. Daredevil took on a kid gang of his own, and became one of the greatest successes of the Golden Age. Yeah he was! He's also one of the more successful characters out of the Golden Age, too. 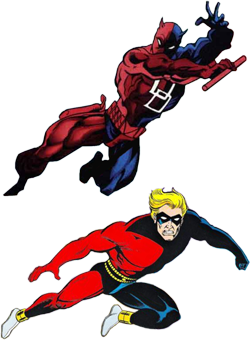 Maybe it's because of his crazy costume, but public-domain Daredevil has been used by a lot of companies under a lot of names (for obvious reasons): Roy Thomas called him "Doubledare" when he showed up in Alter Ego in 1986; in the '90s, he was "Reddevil" at AC Comics; Erik Larsen let him keep his old name when he joined the cast of Savage Dragon in 2008; but that same year, he was known as "the Death-Defying 'Devil" in Project Superpowers. The dude gets around! Originally Daredevil was Bart Hill, a boy rendered mute by the shock of seeing his parents murdered (sometimes it was a constant condition, sometimes he could talk when he was in costume). Three years later, his origin was revised, and he was now - sigh - raised by Aborigines. Eventually Bart Hill became Bill Hart, and the whole "mute" thing was dropped, too. Even his costume changed. It had the same basic bifurcated pattern, but in his first appearance, the costume was yellow and blue; he was revamped for his second appearance, and became the arch-enemy of The Claw, a gigantic yellow peril monster who'd been in Silver Streak Comics since issue #1, making Daredevil an incredibly rare example of a hero who was introduced after his main villain. The Amazing Heroes figures are designed to look like Mattel's 1980s Secret Wars line, so Daredevil is muscular, but posed with a slight squat. All his costume details are simply painted, rather than being molded into the figure, but that big spiked dog collar of a belt he wears is a separate piece tucked around the waist. Daredevil moves at the big five - swivel joints for the neck, shoulders and hips. It's not much for a character known for his gymnastic skill, but it's where this line is at. He does include an accessory, though, and it's a perfect one: his boomerang. Prior to his Australian origin, the excuse for his boomerang-ery was a scar/brand on his chest given to him by the goons who killed his parents. At that point, wouldn't it make more sense for him to use a branding iron? Also, what were the villains possibly hoping to gain by branding a child? The Amazing Heroes figures come in really nice packaging. The Kickstarter said they'd be in window boxes, but the final product is in collector-friendly clamshells - you know, the kind like the Four Horsemen use, where a plastic blister wraps all the way around the backer card, so you can slide it out of the way to get at the figure within. The graphic design is a mix of Mattel's Secret Wars (the general style of the logo) and Kenner's Super Powers Collection (the angled star banner behind the figure) with pictures of all the Series 1 figures across the top and down the side. The whole thing is then given a distressed look, so it feels like these toys have really been hanging, forgotten, on some peg in a dusty toy aisle since the '80s. 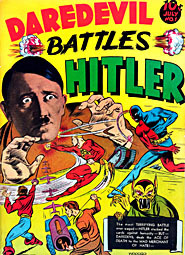 Daredevil was so popular that less than a year after his first appearance, he got his own comic - Daredevil Battles Hitler. There were no immediate plans for a second issue, but publisher Lev Gleason was offered a great deal on some paper; he had to accept it immediately, or the low price would be offered to someone else; and in order to get money to pay for the paper, he had to promise his distributor that he'd have the comic ready to print by Monday. Problem was, this was happening on Friday, and there was no comic to print. 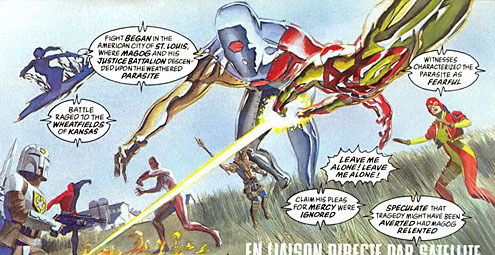 Gleason turned to Daredevil's creator, Charlie Biro, to create the book. Biro enlisted the guys he shared an art studio with, Bob Wood and Jerry Robinson (of Batman fame), to help out. Wood got his brothers in on the action, while Robinson brought his two roommates and one of Bob Kane's ghost artists. A blizzard hit New York that night (March 7/8, 1941), so the eight artists just stayed in and created an entire 64-page comic on time for the presses to roll Monday morning. And then in issue #70 the character was dropped entirely, and the book was taken over by his kid sidekicks, the Little Wise Guys. Daredevil Comics shipped its final issue in September 1956, which means it was probably still on racks when Showcase #4 hit - you know, the DC comic that introduced Barry Allen and started the Silver Age, reigniting the public's fascination with superheroes. Lev Gleason Publications' last book ever came out just a month later. 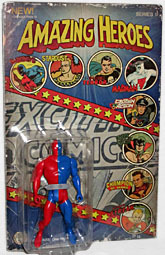 But Daredevil lives on, not just in his name or his various reimaginings: at least one alternate-reality version of Matt Murdock wears a red and blue costume in honor of his progenitor, and a failed attempt to reintroduce the original character at Charlton Comics instead led to the creation of Peter Cannon...Thunderbolt (who is more famous for inspiring Watchmen's Ozymandias, but who wore DD's costume in Kingdom Come). Daredevil is one of the most visually distinct superheroes ever, and at last he's become a toy.